SanDisk Corp. today introduced a 2-gigabyte SanDisk Ultra II SD Plus card, thus doubling the capacity of its award-winning storage card that combines USB connectivity and flash memory storage. The card looks and functions like a typical SD card and its high speed makes it ideal for digital cameras, camera phones and digital video cameras. Folding the unique card in half reveals a high-speed USB 2.0 connector that plugs into any USB port to easily and quickly transfer photos or other data to a computer without the need for a separate card reader. The announcement was made at the Photo Marketing Association (PMA) Show at the Orange County Convention Center where SanDisk demonstrates its products. SanDisk Ultra II SD Plus memory card - The SanDisk Ultra II SD Plus line features write speeds of 9 megabytes (MB) per second and read speeds of 10MB/sec. The cards are targeted at enthusiast and prosumer-level digital photographers with 5 mega-pixel or higher resolution digital cameras that require significantly faster flash memory film cards. The faster cards allow photographers to shoot images in rapid sequence and minimize the lag time between shots. 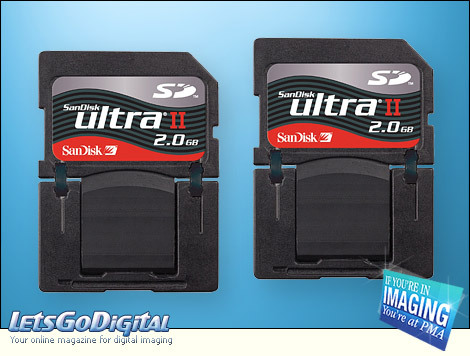 The SanDisk Ultra II product line, which also includes CompactFlash and Memory Stick PRO Duo card formats, allows photographers to quickly capture high-resolution images and take advantage of the advanced features available today in high mega-pixel digital cameras. SanDisk 2GB Ultra II SD Plus flash memory card - Convenient to use - "The SanDisk Ultra II SD Plus card is really convenient to use," said Tanya Chuang, senior retail product marketing manager at SanDisk. "With two gigabytes of capacity you can take many hundreds of high-resolution photos and transfer the images to a computer quickly and easily with the built-in USB connector. We have received an overwhelmingly positive response to the SanDisk Ultra II SD Plus line from both consumers and reviewers alike and have won numerous awards for its innovative design and performance."